Redemption Reef is shortly moving into its Third Season. If you’re new to the online soap, the information on this page will help you catch up with what’s been happening. If you missed a story arc or need a refresher, everything will be right here for you. 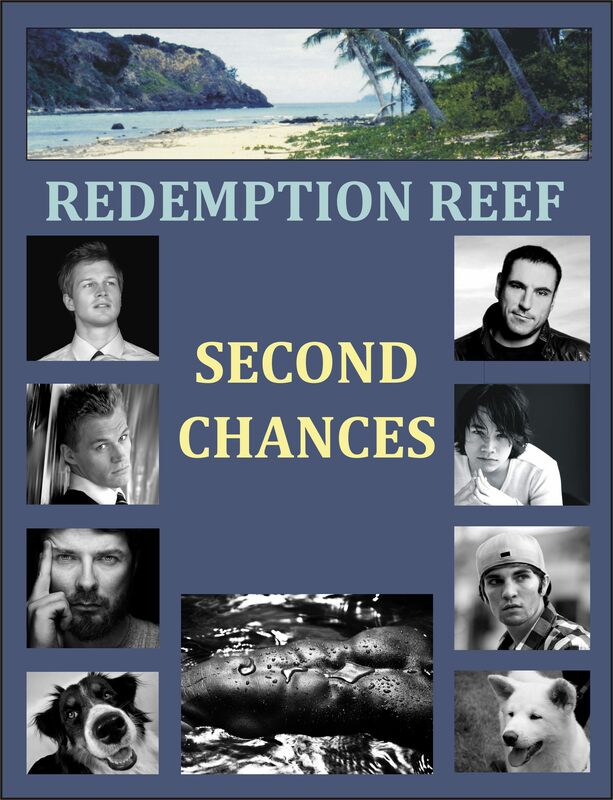 “Second Chances” is the compilation of episodes covering the time our heroes discovered they would be relocated against their will to an isolated reef in the Pacific Ocean. Click on the download link and save it to your computer. “The Hands” contains just our heroes’ episodes from the original online soap. Click on the download link and save it to your computer. Remember while the stories may be free, they are still covered by copyright. Below is a short overview of the story so far, containing massive spoilers. For a better appreciation of the character’s actions and emotional connections, read the full version of what came before. As our first episode here opens, Dr Miles Sutherland, Aiden Parker, Lyle Ashley Tate and Carter (Gil) Gillespie are gathered in Lyle’s living room. They don’t know why they’ve being summoned as all they have in common is their friendship with Flynn Archer, the town’s resident hothead and former bouncer. Last they saw of Flynn, he was being airlifted to the nearest major hospital, unconscious and lucky to be alive after hitting his head on the edge of a shelf after a short but violent fight with the town’s mortician, Henry Vale, who Flynn killed by stabbing him in the eye with a fountain pen. Flynn had snuck into the mortuary in an attempt to free his boyfriend, Aiden, from his prison in a hidden room in the basement where he’d been tortured. Vale had kidnapped him to get at Flynn whose parents he had already killed. It was the discovery of two severed hands belonging to Flynn’s father that set the whole saga in motion. The town’s former assistant mortician, Stan Riley, had detached them from Flynn’s father’s corpse in an attempt to expose Vale’s use of the mortuary to cremate his victims and dispose of the evidence by mixing their remains with others left for burial. Stan himself became the latest to be disposed of in that way, and if it hadn’t been for his planting of the hands and leaving cryptic clues in a diary that he hid inside a sealed frozen TV dinner package, Flynn might have been left to fight Vale alone. However, lucky for him, although he didn’t think so at the time, Miles, an Aussie Doctor, and his work colleague the young British paramedic, Gil, had been in the local park with Flynn when a scruffy dog unearthed the first hand. Seriously out of condition and overweight, Miles adopted the stray, in the hope that taking him for walks would help him get fit again. He called the dog, Roofie, sensing that instead of sleepless nights grieving for his late husband, Darren, he’d have no trouble falling asleep on the couch after excercising his mutt. To complicate matters further, Stan’s replacement as assistant mortician, Lyle Ashley Tate, having run foul of the Italian mafia is himself in hiding under the watchful eye of the Agency. He is a man with a past, a lot of it still hidden from his new friends. It was only when Aiden’s dog, Dante, turned up in the backyard of Miles’ house that Miles and Gil realized that Aiden and Flynn were missing. Accompanied by the two pets, they arrived at the funeral home just in time to save Flynn’s life. While all this drama was being played out, the men’s personal lives have been a tangle of mixed emotions and hot encounters. Miles is perplexed by his own attraction to Gil as he is still grieving Darren’s tragic death from AIDS. Despite harboring unrequited strong feelings for Miles, Gil has also caught the eye of others in the town, especially the Sheriff, Lance Peabody. Even though they haven’t seen much of each other, the chemistry there had been hot and instantaneous. In fact no-one had seen the Sheriff for some time which was lucky for Gil as he already was finding it difficult juggling his feelings for both Lyle and Miles.